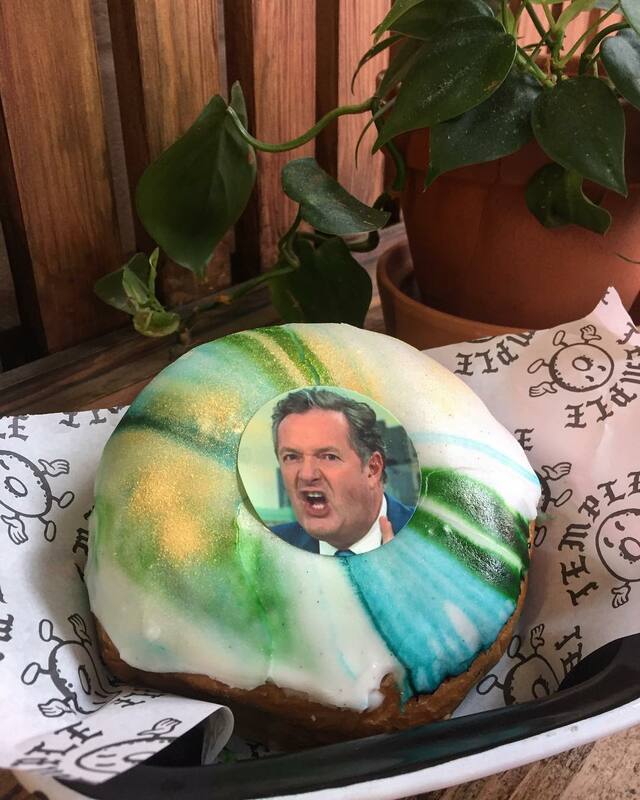 A coffee shop in Leeds has created vegan doughnuts topped with an image of Piers Morgan after the journalist was ridiculed online for slating Gregg’s popular vegan sausage roll. Temple Coffee & Doughnuts coffee shop in Leeds has released a tasty vegan doughnut, topped with an image of journalist and broadcaster Piers Morgan after he made headlines when he Tweeted saying “Nobody was waiting for a vegan bloody sausage, you PC-ravaged clowns” following the news that high-street bakery chain Gregg’s was releasing a vegan version of its popular sausage roll. Not content with sharing his outrage on Twitter, Morgan was also mocked for pretending to throw-up on live television after trying the vegan pastry on the show he co-hosts with Susanna Reid, Good Morning Britain, despite his co-host declaring the baked good to be ‘delicious’. The owners of Temple Coffee & Doughnuts, Nadine Oxley and Simon Erl, were shocked to see the coverage given to Morgan by the press, believing it to divert from more serious issues and so decided to put a positive spin on the negative by creating a Piers Morgan vegan doughnut, the proceeds of which they gave to charity. In an Instagram post, the shop explained the decision to adorn the baked good with the image of the controversial journalist, saying: “So, we all know this moron has kicked up a fuss about vegan sausage rolls and somehow managed to make front page news with it. We don’t know about you, but we find it very sad that crying about sausage rolls takes the focus off the real tragedies that are happening in the world. Unfortunately, the vegan doughnuts are no longer on sale as only 1oo of the tasty treats went on sale on Saturday (January 19) to raise money for Unicef.